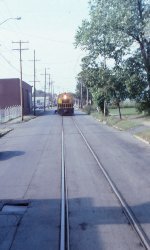 Title: NYSW 120 takes Staten Island Railway RV1 east. Description: SW9 120 was a former B&O unit, picked up by the NYSW when they took over SIRY service. B&O had let it go in April 1985 when they were cut off from their connection by Conrail. Suzy-Q ran the service until about 1991. NYSW #120 was delivered to the B&O 1952/53 and had friction bearing trucks that restricted it to 25 mph. It is now the American Motive Power Inc (AMPI) shop switcher in Dansville NY. Description: NYSW in the 1980s acquired the Rahway Valley and former B&O line to Staten Island. Base for these operations was the small B&O facility in Cranford, adjacent to the ex CNJ, over whom B&O had trackage rights. NYSW 120 has just returned from working the RV, and has crossed over the CNJ-now NJ Transit-main at Excee tower, and will be taking the switch into the yard. This was a much busier place in CNJ days, as evidenced by the signal bridge in the distance. It was then four tracks, and a place where a train could cross over all of them. B&O and Reading passenger trains passed here, as did their freights. Description: The conductor rides the steps as NYSW 120 rolls over this street crossing in Kenilworth, momentarily interrupting the progress of a couple of locals.. Description: NYSW 120 has spotted its cars on the Rahway Valley and is headed back to Cranford to tie up. The conductor is signalling to the engineer to slow up, as he must drop off to flag a crossing. Description: Excee tower, named for its telegraph call sign, XC, controlled the junction of the CNJ and Rahway Valley, as well as access to the small B&O yard south of the main, which also was the access to the B&Os Staten Island Rapid Transit, though most freight service was to the Port Ivory area, a freight only part of the SIRT. NYSW 120 has just come off the RV and is crossing over to reach the yard, where it will tie up. Title: NYSW 120 passing Excee tower. Description: It was unusual to see these two units together, especially since 120 spent most of its time in Jersey. I caught them together at the Binghamton shop. An RS 3 and SD 45 are peeking out from behind these two. The variety then was amazing.